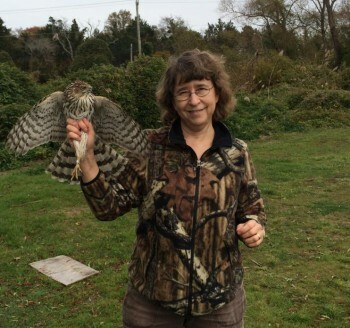 Professor of Physics Suzanne Amador Kane used a headcam on a goshawk to learn how it searches for its prey. New research from The Auk: Ornithological Advances suggests that the neural processes underlying visual search behavior in hawks are similar to those in humans. To study a raptor’s head movements while hunting, the scientists behind the study recruited an unusual research assistant—a Northern Goshawk named Shinta, fitted with a tiny head-mounted camera. Raptors such as hawks and eagles are visual predators, using their eyesight to navigate their environment and locate and capture prey. To do so, they alternate periods of rapid head or eye movement called saccades with periods where their vision is fixed on a specific point. By studying the mathematical distribution of intervals between saccades, Suzanne Amador Kane of Haverford College, Michael Ochs of The College of New Jersey, and their student collaborators determined that the head movements exhibited by hunting hawks are not regular and predictable; instead, hawks alter the patterns of their head movements based on environmental information, with the time between saccades changing as a bird detects a potential target. This stochastic decision-making strategy is similar to patterns seen in human search behavior. Suzanne Amador Kane with a hawk. Photo by Casey Setash. Physics major Marjon Zamani '13 initiated this research in her senior thesis and is listed as a co-author on this paper. (This is her second publication with Kane.) Zamani is currently pursuing a Ph.D. in biomedical engineering at Boston University.